Another day another loss for the 2014 Tennessee Titans. It feels true because the Titans have done a lot of losing lately. The Titans have a new coaching staff but otherwise nothing much has changed. Players that struggled to perform under the old coaching staff continue to struggle now and are learning new systems to boot. 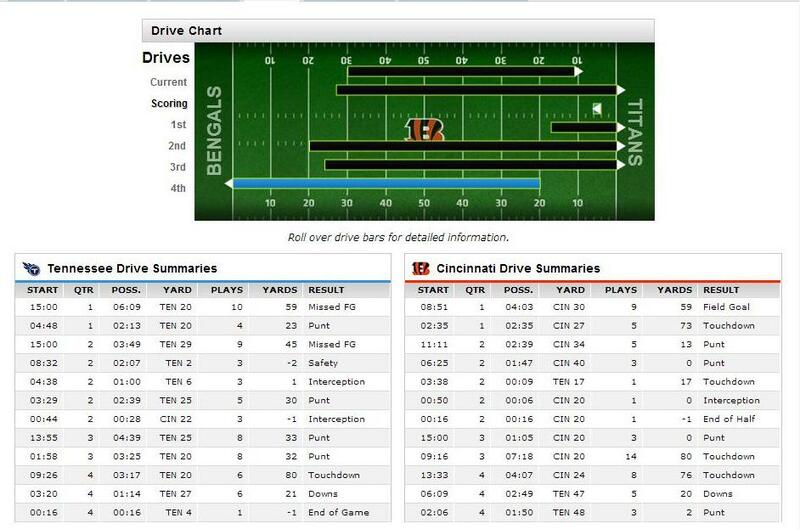 The results under the new coaching staff have been mixed as the Titans fell today to the Bengals 33-7 in Cincinnati. The Titans are currently 1-2 (1-1 in the AFC) and looking like the same old Tennessee Titans. Quarterback Jake Locker continues to take one step forward and two steps back. Today was his worst game by far of the 2014 season. Locker is on his third offensive coordinator and you see the wheels grinding in his head when he is on the field. The overwhelming number of responses cited the quarterback position as the main reason for the Titans woes. In all fairness, it is hard to blame them. The following is a sampling of the responses I received. Thanks again to everyone who participated. @Jrob529 @SportsbySharona @TheHomieDJ I didnt realize Jake gave up 33 points. @jsuzyb @SportsbySharona @TheHomieDJ so you think putting clipboard Jesus in is gonna get us to the playoffs. And play defense? @SportsbySharona We need a new QB. All that really needs to he said…. Locker was bad today there is no sugar coating it. He has started out slowly in every game this year and improved in the second half. Today, there might have been slight improvement in the second half but it was very marginal. Overall just not a good performance from him. 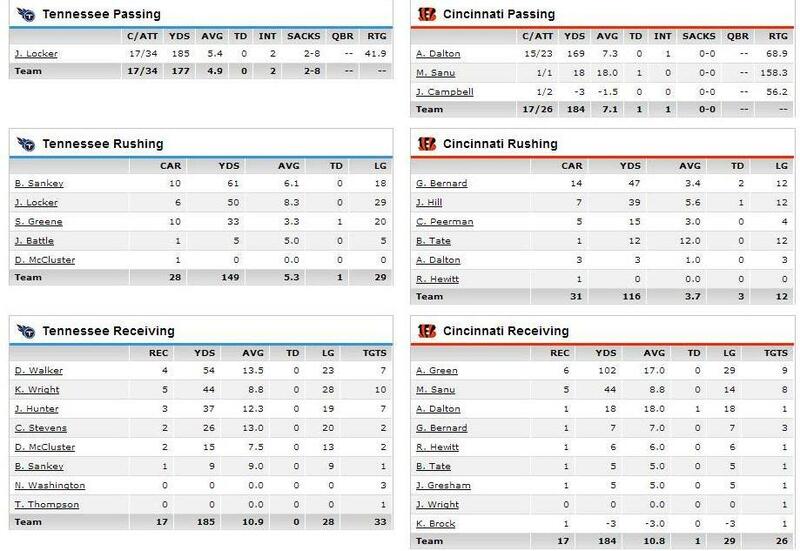 He went 17 of 34 for 185 yards, no touchdowns and two interceptions. He carried the ball six times for 50 yards. He also took two sacks for a loss of eight yards and was under pressure constantly in the game. He fumbled twice though neither were lost and one was on a bad snap exchange. He finished with a passer rating of 41.9. It was a bad performance from Locker but he wasn’t alone. The Titans wide receivers are soft as Charmin. They have consistently been out muscled and rarely win contested balls. Nate Washington needs to be placed on a milk carton. He was targeted three times today and finished with no receptions. The Titans defense has yet to find it’s footing. You can see defensive players struggling as well and thinking too hard. Second year cornerback Blidi Wreh-Wilson particularly struggled today and is one of the young players who seems a bit lost in the new defensive system. Titans special teams were simply dreadful with Ryan Succop, the lone bright spot from the first two games, picking an unfortunate time to play poorly. He missed two field goals but did make an extra point. Brett Kern likewise struggled and was lucky not to get one blocked today though it certainly would not have been entirely his fault. He isn’t getting much help as coverage units continue to play poorly. The return game is simply mediocre. The Titans gave up a safety on a bad penalty by linebacker Quentin Groves in the end zone. Despite how poorly this team played caution is warranted here before any lasting impressions are formed. This was a team still reeling from the early morning revelation that longtime Titans kicker Rob Bironas had been killed in a single car accident. Bironas was well liked in the league and had recently married Terry Bradshaw’s daughter Rachel. He was close with many remaining Titans including punter Brett Kern. He was Locker’s place kicker his first three seasons in the league. It’s never easy to lose someone close to you. Yes it’s still a job and certainly they have to perform. The performance was definitely sub-par but should be taken in context. The Titans are three games into the season and there is still a lot of football left to play. The team simply has to get better or they will continue to lose games. I’m not in favor of making a quarterback change right now. Locker should get the start next week against the Indianapolis Colts if he is able to play. I would also continue to give him first team snaps in practice. The talent around him needs to step up and help their young quarterback. He isn’t struggling alone. No doubt time is running out on Locker. No question he has to perform better. If he continues to struggle the next game or two then a quarterback change should be contemplated. At that time, I would open the competition to all three quarterbacks with an eye toward starting Zach Mettenberger if he proves close to being ready. It does no good to start Charlie Whitehurst because he isn’t a long term option. As for Blidi Wreh-Wilson, what options do the Titans possess? They have no depth at the position and I have seen nothing from Marqueston Huff to indicate he is close to being ready. They could switch Coty Sensabaugh to the outside but he struggled there in pre-season play. Outside options seem limited. The only choice is to improve or simply continue to struggle and lose games. The Titans front line could certainly help the situation by getting consistent pressure on the quarterback which they have failed to do. 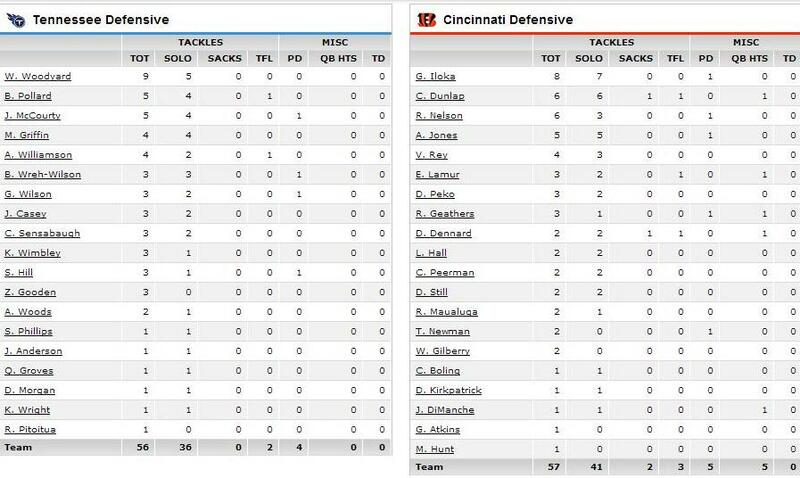 The Bengals offensive line is extremely good and the Titans did not register a sack on Andy Dalton. Dalton had plenty of time to operate out of the pocket. Right now the grade on the coaching staff is mixed as well. The Titans have looked unprepared two weeks in a row. I’m sure it was difficult to get the team prepared under the circumstances today. The play calling remains head scratching at times. On top of other gaffes today, the Titans were penalized 11 times for 99 yards and continue to look undisciplined at times. There were some bright spots and rookie running back Bishop Sankey was one. After looking a bit lost in the first two games, Sankey made the most of his opportunities today. He carried the ball 10 times for 61 yards and a 6.1 yards per carry average. Shonn Greene added 10 carries for 33 yards and a touchdown. George Wilson intercepted an Andy Dalton pass with about a minute left in the first half. Wilson continues to play very well for the Titans. Unfortunately, the Titans ran two unsuccessful plays and Locker threw an interception to end the half. The Titans travel to Indy in Week 4 and then return home in Week 5 to face the Cleveland Browns. The Browns home game could present an excellent time to make a quarterback switch if one is warranted. The entire team needs to step up and play better. The Houston Texans lost to the New York Giants 30 to 17 while the Indianapolis Colts lodged their first win beating the Jacksonville Jaguars 44 to 17. The Titans and Colts are only one game behind the Texans. Full stats can be found here and gamebook can be found here.